The Minnesota Coen Brothers turn from black comic irony to a more literal remake, of the 1969 Paramount western “True Grit”, based on Charles Portis’s novel. It’s even the same studio (Paramount), but this time the brothers offer full wide screen, and countryside that looks closer to the Ozark country of Arkansas and Oklahoma. The film was shot in the Texas Hill Country, in the winter (but there’s one good shot with some dry light snow), and New Mexico (there’s one distant shot of the Sandia front range, that is out of place). The older film had geography off by about a thousand miles. What the brothers offer here is witty dialogue and characters solving problems, in ways that relate to the frontier, the “Midwest” of the 1870s. In this kind of world you do what you have to do. You watch other people’s back, and you can say some funny things doing so. Hailee Steinfeld plays 14-year-old Mattie, who is certainly a prodigy intellectually and in business matters, and she is very determined to honor and avenge her father’s slaying. Jeff Bridges, a bid of a codger, plays US Marhsall Rooster Cogburn, and Matt Damon plays itinerant Texas Ranger La Boeuf. (Where is Shia?) Mattie has to handle them both, as well as villain Josh Brolin (also in “No Country for Old Men”). The climax of the movie is a bit of happenstance, and recalls the dangers of spelunking, with Mattie in a situation not so unlike James Franco’s, but fortunately there is help. There is an epilogue, where we learn what happened later (Mattie never married – hint). That conclusion takes place in Memphis in 1903, hardly the Wild West. There is a sequence in the middle where the tag team approaches a shack on the open range at night, that recalls a bit the kind of work the Coen Brothers have done before. There’s no way to avoid a body count, and this time it’s not quite as funny. I bet, however, that the film waits in line for Best Picture. You can see Paramount’s original casting call website for the role of Mattie in the movie here. The official site for the film is here. 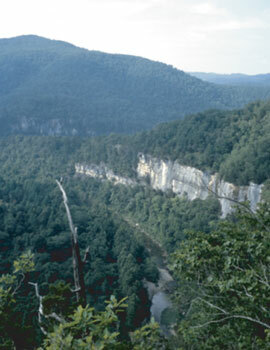 Wikipedia attribution link for Arkansas mountain scenery.